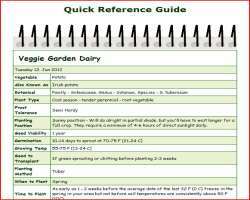 The growing broccoli quick reference guide below is designed as a quick overview of growing broccoli. For more details on the different stages from seed to harvest go to the related pages link. Plant Spacing Transplant or thin seedlings 12-18 inches (30-45 cm) apart in rows 24-30 inches (60-75 cm) apart or for a grid, stagger plants 18 inches (45 cm) apart in each direction. Fertilizer High fertilizer needs, 5-6 quarts per 100 sq feet (5.5-6.6 liters per 9.3 square meters) pre-planting of All-Purpose 5-5-5 Organic Fertilizer , same rate for each side dressing. When to Fertilize 2 weeks before sowing or transplanting - when transplanting use liquid starter fertilizer - side-dress every 3-4 weeks - last side-dressing as the heads begin to show.